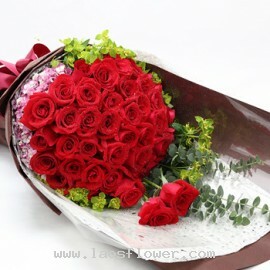 48 roses are beautiful and large bouquet. The recipients will be impressed. 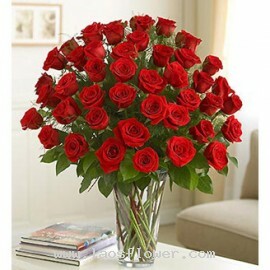 48 red roses arranged in a clear glass vase. We will add a beautiful ribbon on the vase. The color of roses and ribbon can be changed. Occasionally, substitutions may be necessary to create your bouquet due to the availability of certain flowers in various parts of the country. Substitutions may ..
A bouquet of 48 red roses arrange in round shape with 2 roses pop up on the top accent with pink wax flowers and beautiful leaves on one corner and eucalyptus leaves stand up on the back. Wrapped a bouquet with white & dark brown papers and clear plastic and tied with red ribbon. This bouquet is..